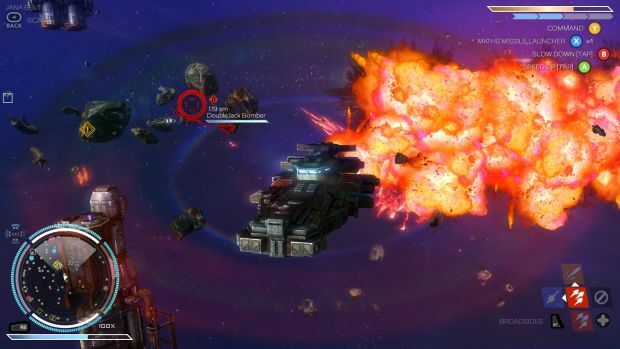 Rebel Galaxy [official site] came storming out of warp recently and has been threatening people with its giant starboard cannons, telling them to come and join the space cowboy adventure. We told Brendan to get on board, or else. Let’s see wot he thinks. You start out in a rustbucket on a mission to find your Aunt, who has gifted you the aforementioned ship and gone AWOL. The ship is called the “Rasputin”, but I quickly fixed that in the hangar by renaming it the “Wobblenaut”. The story of Rebel Galaxy spools out from there, involving treacherous aliens, strange artifacts and a mysterious AI lady with the obligatory amnesia. But none of this is very important. Getting into fights and scrapes is the meat and spuds here and the combat itself is likely where you’ll spend most of your time. The first thing you’ll notice is that everything is on a single plane. No 3D dogfighting manoeuvres here. The ships are massive capital class frigates, destroyers and the like. And as such they control more like naval vessels than space shuttles. You steer around your enemies in long arcs using the A and B buttons to throttle up and down and the analog sticks to pull your hulking beast into line (it recommends you to play on a gamepad). This means that fighting is about pulling up alongside your foe and unleashing a huge volley with your broadside cannons. You can hold the aiming trigger to make shots more accurate or, if you’re very close, just go crazy and pray the shots land. 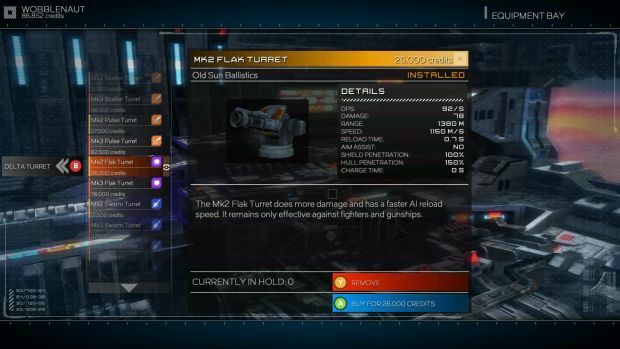 Turrets and missile systems allow you to fend off fighter craft and incoming rockets (you can switch to use these turrets manually but if you remain in control of broadsides they’ll remain automated, firing at a slower but steady rate). You can also boost for a short time to catch up with a target and you can use a deflector shield to temporarily stave off all damage. Or you can get the hell out of there. Warp involves charging up your drive and blasting out of the combat zone. You can still steer your ship in this mode, speeding towards your destination. But if anything gets in your way or interrupts your path by a few hundred space metres, you will drop out of warp due to this “stellar mass”. This also means that to escape from a fight, you need to put enough distance between you and your pursuer to bound away. When you aren’t engaged in ship-to-ship warfare, you warp between stations and travel from system to system, trading goods, taking missions and keeping your boat in good nick. As far as this goes, it is fairly straightforward. Guns and equipment can be changed around in the hangars of any space station and there are different types of damage and attacks. For instance, on a ship with four turret slots, I fitted 3 pulse cannons (which are the vanilla flavour of firepower) and one flak cannon (strawberry flavour), which could attack fighter craft and gunships but was useless against capital ships. You will fiddle with your setup constantly. There are particle lasers that are excellent against armour but rubbish against shields, or there are “Swarm” missiles that automatically fire at pesky fighters, or “Leech” missiles that cripple your victim’s engine. There is a platter of increasingly expensive subsystems that augment your vessel, increasing aiming speed, ship maneuverability, reloading times and so on. And there are all the usual bits and pieces for your ship: shield systems, engines, cargo holds – all upgradable. One of my favourites being the ‘Smuggler’s hold’, which allows 4 units of cargo to be held in an unscannable compartment. I’ve described the battles and shipyard features before anything else because your ship is clearly THE thing about this game. You play for no other reason than to spend your way up the tech tree. The story isn’t very compelling and the characters, although well-modeled, are all straight out of Star Wars. The gurgly voices and sticky mandibles remind me of nothing but Mos Eisley. I want to like the alien races and their weird words but without much attendant knowledge, trivia or facts about them I just can’t bring myself to care. I can’t help comparing the characters to other alien videogame friends. In Mass Effect, for example, the Elcor are a race of monotonal giants, who have to make a declarative statement about which emotion they are showing before each sentence, simply because their facial expressions are too subtle for any human being to understand. In Rebel Galaxy, one of the races “used to be burrowing critters”. One of these is an interesting cultural characterisation. The other is not. But anyway, yes, the ship is what matters. To get the cash to keep improving you can take jobs from a variety of places. The story missions will always be there, but side missions crop up as well, including errands for different guilds. 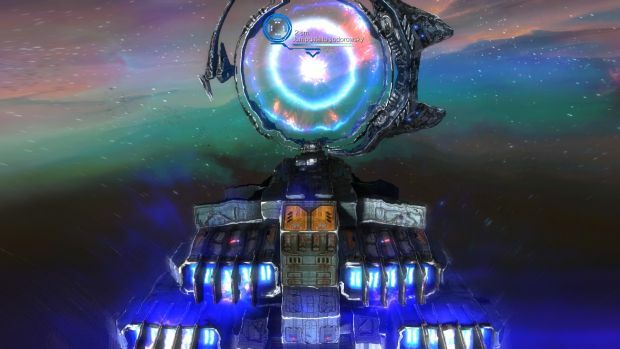 These guilds, once joined, offer you access to new types of ships and specific mission types. For example, missions listed in the Merchants Guild involve hauling huge batches of cargo, while missions listed in the Mercenaries Guild are more murder-based. In unaligned stations the missions are a mixed bag and generally you just end up accepting a bunch of the highest paying ones without even reading them. After all, the objective markers tell you where to go and what to blow up. This is where Rebel Galaxy really loses me. Everything feels so A to B. It’s the eternal curse of the space game, to be a glorified delivery boy simulator. In other space games I can absolutely deal with this. 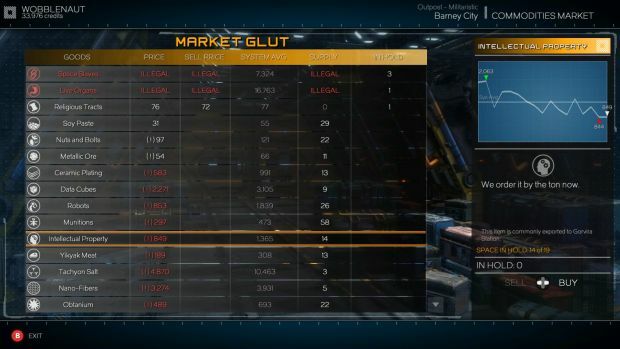 I played Elite: Dangerous to death, and that was not exactly free of the same problem. But here I feel very limited, very constrained by the lack of variety. 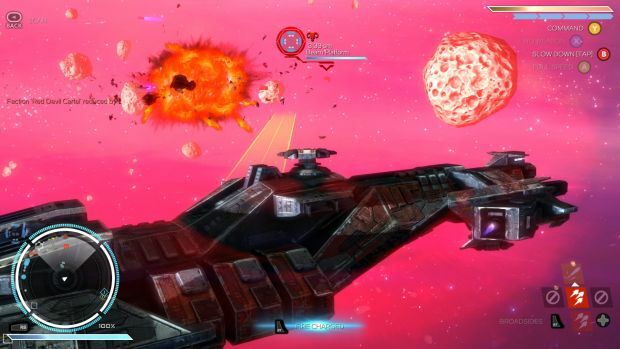 It does not help that Elite has essentially spoiled me and, as a result, Rebel Galaxy feels very light in comparison. All I want, when I am being mauled by a pack of hungry pirate Corsairs, is the ability to go DOWN. But I can’t. Not in this universe. One thing it does do better than Elite is bring a bit of personality to the occasional space fracas. You can often hail your attackers and ask them what the big deal is, sometimes giving you the option to get out of the scuffle without any more bloodshed. I happily bribed a militia commander into turning a blind eye to illegal contraband when she scanned me down and threatened to blow me up if I didn’t jettison it. And when I was pestered by a band of bristling pirates, I offered to drop my cargo and we could forget the whole thing. The interactions seldom go further than paying your way out of a fight, but it does add a bit of flavour to the galactic highways. By contrast, in Elite, all you usually get is a text message saying “wah wah wah I want a fight”. There are other ways RebGal spices things up. 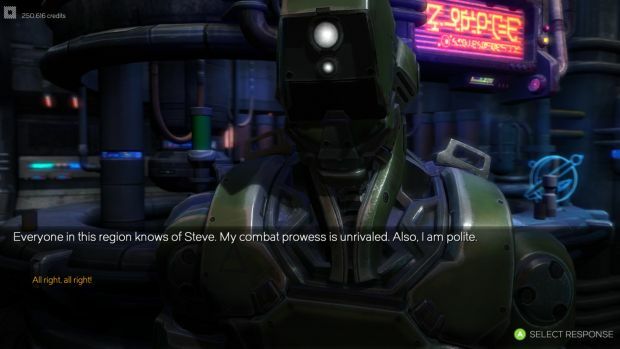 The ability to hire a mercenary in the bar of any space station, a little mate who flies around you like a guardian mosquito and quips politely away, is a great feature. Even though some of their accents were certifiable atrocities, I felt real concern for my mercs, much more than my stupid aunt or any of the Greedo-likes I met along the way. I only wish the game had done more with these companions. Things like this make it feel much more vibrant, but then it is let down by other nuisances. The non-stop cowboy rock soundtrack is grindingly bad to my ears (I muted it within the second hour of play) and there is a baffling over-reliance on the context-sensitive A button. The A button is used to throttle up, to dock, to go to warp, to pick up loot, to drop out of warp, to accept hailing messages, to pair up with a wingman, and lots of other mission-specific things. It is one of my most-hated design decisions when a game maps almost every meaningful thing to a single all-purpose switch. It makes the player immediately conscious of the “game” because they are always looking out for the moment when the context switches. And it conflicts with the attitude that governs the rest of the buttons on the controller, where you can develop a straightforward reflex akin to muscle memory for simple, yet specific actions. Crowding dozens of actions onto a single button makes it feel like the backseat of an overpopulated carpool, with multiple voices vying for attention telling you to turn the radio up, roll down the windows, take this right turn, we need to stop for a piss, oh god please all of you JUST SHUT UP. Well, at least the galaxy is a busy place. There’s no emptiness to this space at all. Convoys full of cargo move from point to point, ripe for the picking. Treaty vessels zip across the system in a bid to make peace. Pirates and scum hang out in debris fields beside the gargantuan carcasses of fallen victims, or amid glistening shards of ice in dark belts. There are nebulae that interfere with your radar, or where storms rage that can randomly knock out your shields with a bolt of space lightning – a wonderful touch. Traveling from one system to another also sees a spike in difficulty and new ship parts becoming available. So it becomes this desperate uphill clamber through the sector, constantly tweaking your ride against the next deadly foe. There’s also a faction system in place that sees you in good or bad favour with the warring clans of space. Often I stumbled on brawls between these factions, just by accident, and having no reason to irritate either one, simply left. Unlike a lot of space sims, you are never in warp for very long without something happening. If anything, you are maybe interrupted by vessels and asteroids a little too often. 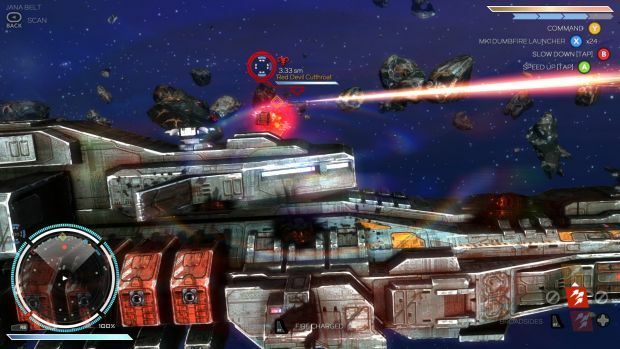 But when a major sin of space games is watching the dead of space go by for minutes at a time, it feels unfair to critique Rebel Galaxy for wanting to get you involved. What is a fair critique is that, ultimately, none of it matters very much. As I said, the state of your ship is what keeps you going. You fight more to earn more to buy more. In this way it is a very transparent game. But also a repetitive one, and overall, a mixed bag. I know a game is not capturing me when, as a reviewer, I keep checking my “hours played” stat on Steam to see if I can fairly say: “OK, that’s enough”. Still, I recognise there are always those who want more space sauce, who won’t mind fighting on a 2D plane, and who will be much more possessed by upgrading their own “Wobblenaut”.